Want to find out about the investment opportunities in this market? Wondering where your Brabant-based opportunities might lie? Download our report for all the facts and figures. Virtually all the office space standing empty in Eindhoven, Breda and ’s-Hertogenbosch fails to meet the requirements of companies looking to lease. That is the conclusion reached in our latest market publication Brabant: The Property Perspective. 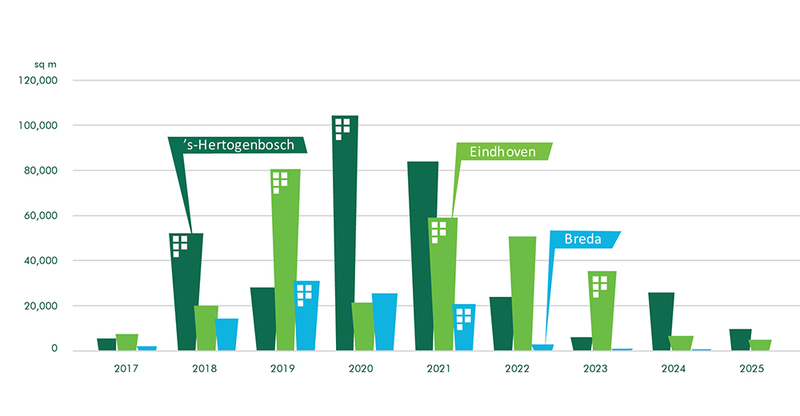 The dearth of quality office space combined with rising demand and robust growth in employment makes investing in Brabant essential. Igluu Eindhoven is situated in the Lichttoren, part of the Witte Dame complex. Across Eindhoven Central Station, with underground parking spaces, and in the heart of Eindhoven. Our dedicated staff at the Eindhoven office looks forward to providing you with the same high-quality services from A to Z that you have come to expect from us. With specialists in all sectors and in every area of real estate, we work closely with investors, financiers and end users to find solutions for their real estate and housing. Whether it’s an office or an industrial property, our all-round Southern Netherlands team has in-depth knowledge of the region and is ready and able to help. Our deep-routed knowledge of the South goes beyond the region’s rich history and exuberant ‘Burgundian’ character. The collective economy of the bustling South is now the second largest in the country. Did you know that Eindhoven has been much more than simply the City of Light for quite some time? Eindhoven is proud to now also be the Design City and Brain Port of the Netherlands. The city also boasts the country’s second largest airport, making it easily accessible for international business travellers. Our offices may be new, but we are certainly no novice in the real estate market of the southern parts of the Netherlands. By combining extensive expertise and experience with tonnes of enthusiasm and motivation, our Southern Netherlands team is able to offer you the best of both worlds.